usSEABED data for the Gulf of Mexico and Caribbean showing locations of the extracted (EXT) and parsed (PRS) outputs. The PRS data consist of word-based descriptions. The EXT data consist of numeric, lab-based analyses. Click here for larger image. Over the past 50 years there has been an explosion in scientific interest, research effort and information gathered on the geologic sedimentary character of the United States continental margin. Data and information from thousands of publications have greatly increased our scientific understanding of the geologic origins of the shelf surface but rarely have those data been combined and integrated. This publication is the first release of the Gulf of Mexico and Caribbean (Puerto Rico and U.S. Virgin Islands) coastal and offshore data from the usSEABED database. The report contains a compilation of published and previously unpublished sediment texture and other geologic data about the sea floor from diverse sources. usSEABED is an innovative database system developed to bring assorted data together in a unified database. The dbSEABED system is used to process the data. Examples of maps displaying attributes such as grain size and sediment color are included. 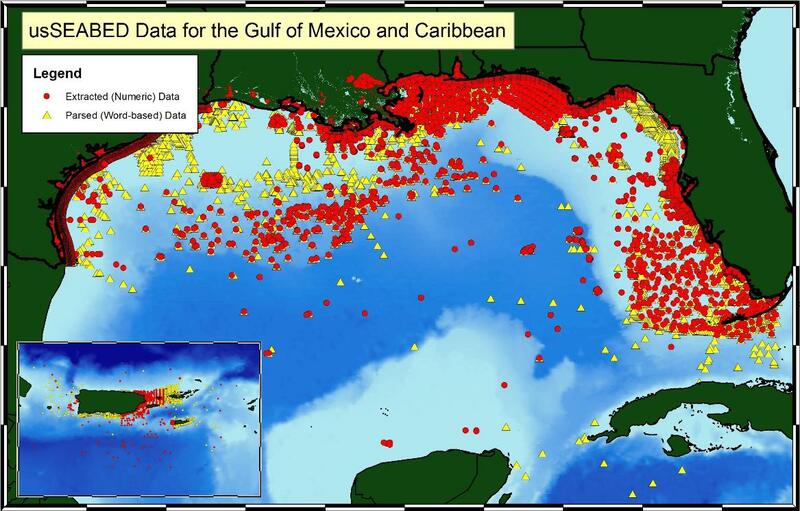 This database contains information that is a scientific foundation for the USGS Marine Aggregate Resources and Processes Assessment and Benthic Habitats projects, and will be useful to the marine science community for other studies of the Gulf of Mexico and Caribbean continental margins. This publication is divided into ten sections: Home, Introduction, Content, usSEABED (data), dbSEABED (processing), Data Catalog, References, Contacts, Acknowledgments and Frequently Asked Questions. Use the navigation bar on the left to navigate to specific sections of this report. Underlined topics throughout the publication are links to more information. Links to specific and detailed information on processing and those to pages outside this report will open in a new browser window.